Ensure that the installed Coveo Search API version is 8.0.457 (March 2015 monthly release) or later (see Identifying the REST Search API Version). If you have an older version, download the latest Search API 8 version and update your server to this version. Using a browser, access a Search API hosted search page by entering the URL of the page. In the Interface Editor lower-right corner, click the Interface Editor menu button ( ). Note: If you do not see the Interface Editor menu button ( ), or nothing happens when clicking it, you either do not have permissions to create or modify the search page or the installed Coveo Search API version is prior to version 8.0.457. When not already authenticated, in the browser login dialog box that appears, enter your credentials. 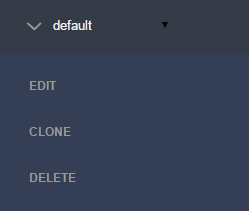 In the Interface Editor menu, click Edit. The Interface Editor appears in a side panel on the right.